NachoFriend Racing has been accepted into the 2018 Smells Like Teen Spirit race at The Ridge in Shelton, Washington. This will be our second race of the year, after having finished 3rd in class at Sonoma in December 2017 and March of this year (yes, we finished 3rd in C Class twice in a row). 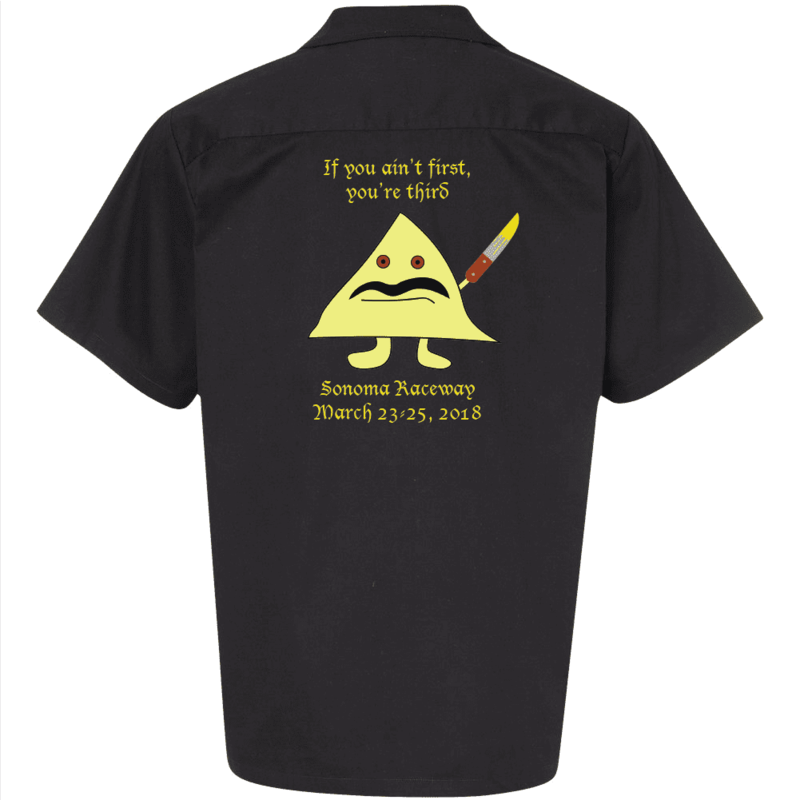 Before our third place finish at Sonoma in March, we printed up these shirts for the race. 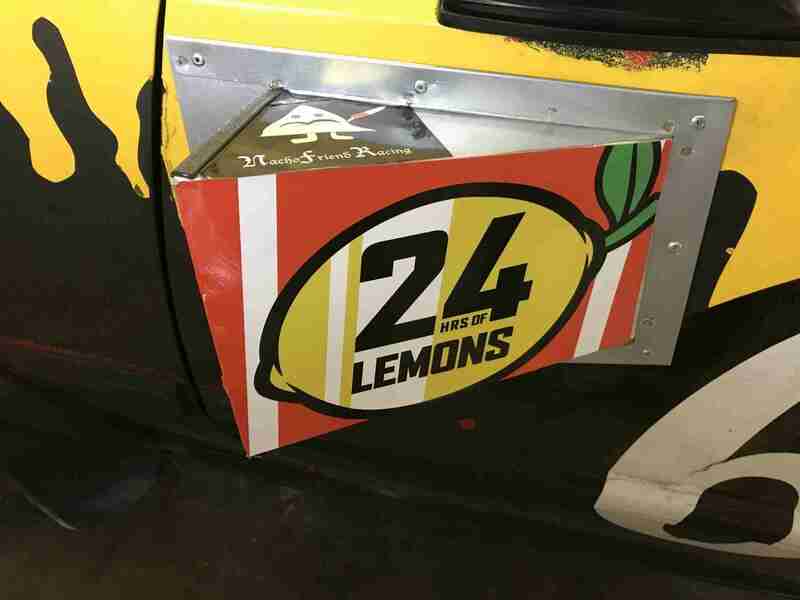 The NachoFriend 1985 Toyota Celica GT-S has proved to be quite reliable in LeMons racing. We’ve had no fatal issues in the last few races other than a rear caliper-mount bolt that fell out, causing the caliper to lodge against the wheel and stop forward momentum and a leak just past the exhaust manifold. 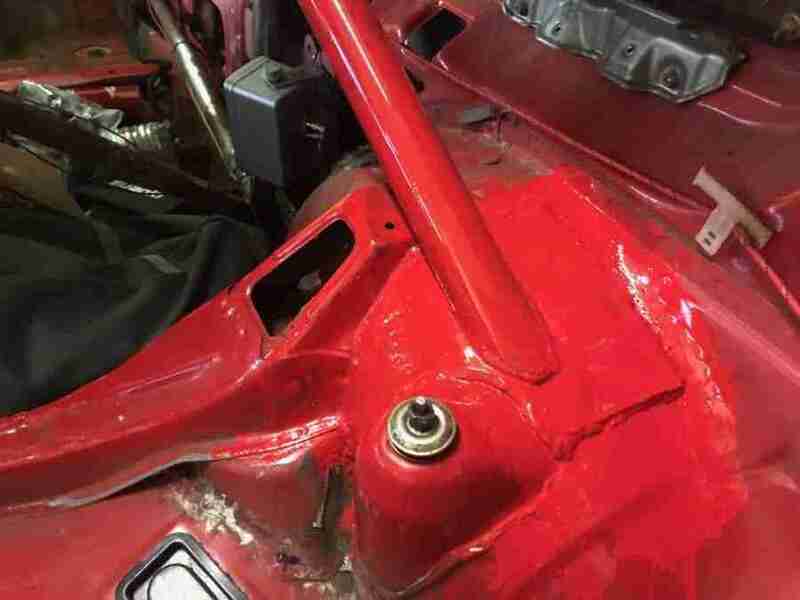 Red Loctite will prevent future caliper bolt exits and the recurring exhaust leak was fixed by securing the downpipe to a mount by the firewall and using a factory Toyota exhaust seal. Any performance improvements have been ignored by our team. Instead, we are focusing on staying in, and perhaps one day winning, the C class. We have limited enhancements to safety and convenience. One such modification was lowering the floor of the Celica. One of our drivers is 6’2″ and, with a helmet, his head is too close to the halo of the roll cage. He got tagged for this at our first Sonoma race, as described here. Dropping the floor improved driver safety and necessitated removal of the catalytic converter, which was directly underneath the driver’s seat. The exhaust sounded a bit better and the car was lighter, but I don’t think performance was otherwise significantly improved. Getting in and out of the racing seat with its factory steering wheel was a major inconvenience. One had to make up yoga poses in order to get one’s body over the door bar and under the steering wheel. Downward dog would not cut it. The steering wheel was adjustable and putting it in the highest position did help, but precious time was lost during re-fueling stops. We solved this by installing an NRG quick-release steering wheel hub. For a 1985 Celica, it’s NRG part numbers SRK-120H (hub adapter) and SRK-650RD (quick-release kit). By pulling two tabs, one on each side of the steering wheel, a driver could easily disengage and remove the wheel. This makes exiting the car much faster, which is extremely important if the car catches on fire. NRG Quick Release Hub. Red to match the interior, of course. Gauges other than the tach have since been relocated. 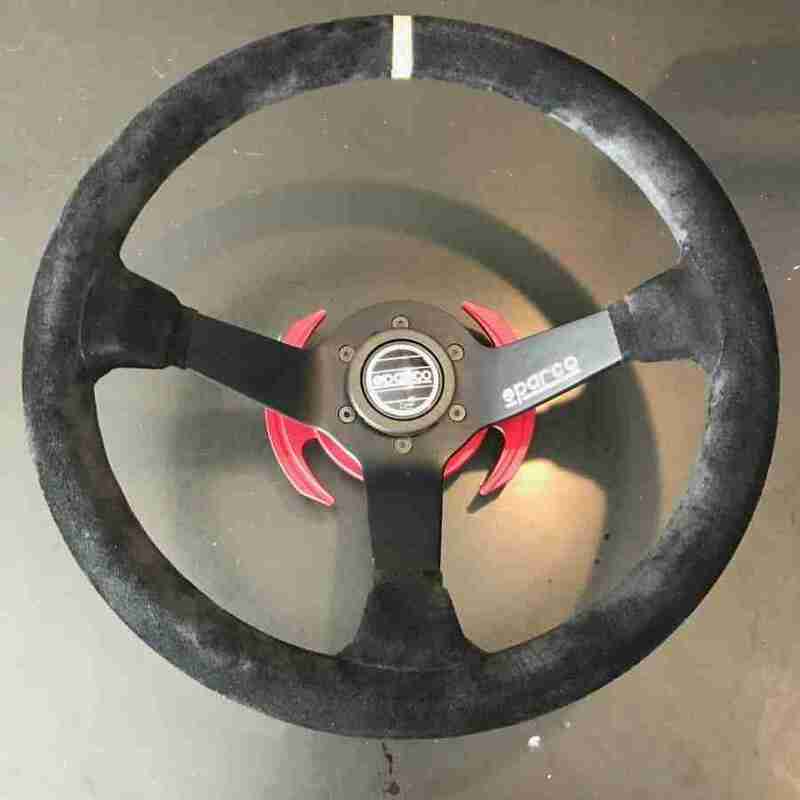 I did not want to put the original slick Toyota steering wheel back on the car, so we ordered a nice black suede 3-spoke Sparco steering wheel from Summit Racing (Sparco # 015R325CSN). This wheel is very comfortable in the hand, which you can’t tell during a race because we are all wearing gloves, but it’s also very grippy. New wheel with the stripe so we know when we should be going straight. The photo 2 pictures above, showing the quick-release hub, demonstrates where are gauges were. We had ditched the factory gauge cluster, which was zip-tied to the right of the driver, but with the new setup, things were all over the place. A gauge to the left, tach above the column (where it should be), other gauges to the right, a start button where the center console would be. I wanted an integrated gauge cluster. I bought a lightweight aluminum metal enclosure measuring 12x7x4. This one is made by BUD Industries, their part number CU-21-B. It is a 2-piece project box, making it easy to mount gauges after creating holes for the gauges with a hole saw. I painted it black so shiny aluminum wouldn’t blind drivers as they hit the uphill turns at Sonoma (though that would be funny). 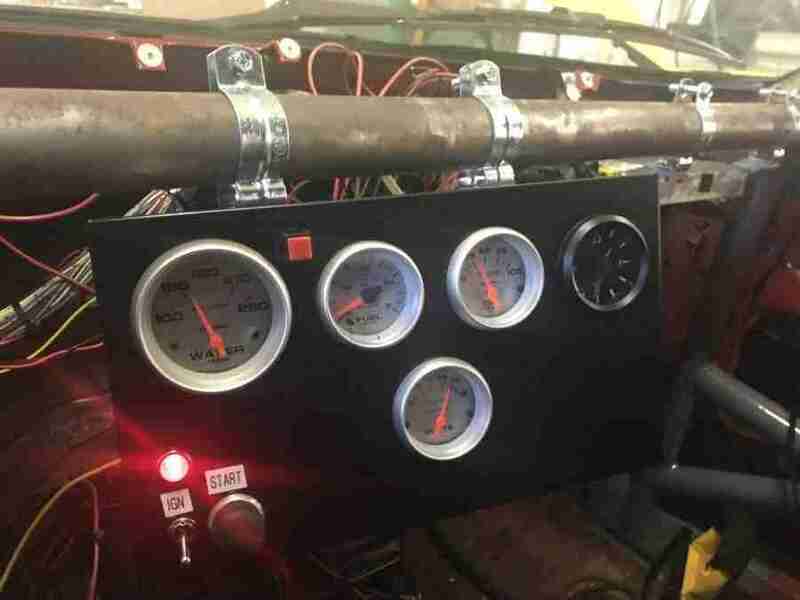 I mounted the water temp gauge, fuel gage, oil pressure gauge, a clock and voltmeter. The ignition switch, light and starter button were relocated to this cluster. There is a red button, which drivers are admonished to never push, which calibrates the fuel gauge. There is a USB charger on the side of the box so drivers may charge their phone while texting or listening to music. I left room in the box for future gauges. Some day we might want to know the oil temperature. Perhaps a screen for GPS directions for our drivers inclined to get lost? All the information in one spot. Well, most of the information. Tach is still on steering column. Our cage was beautifully fabricated. The welds were to welding what Chuck Norris is to toughing. LeMons tech judges go silent when they see its majesty. When new, its bare metal shined. As it aged, however, surface rust started to develop. Our once shiny cage was turning ugly. I got some Scotchbrite pads, a foam brush, rust preventive paint and topcoat and went to work. This task took a lot of time. The Scotchbrite effectively removed the rust, but there is a lot of round stock in this car. Once the primer was applied, it then had to be scuffed for the topcoat to adhere. After many days of work, we had a shiny red cage that wouldn’t rust. Cage going from grey to red. 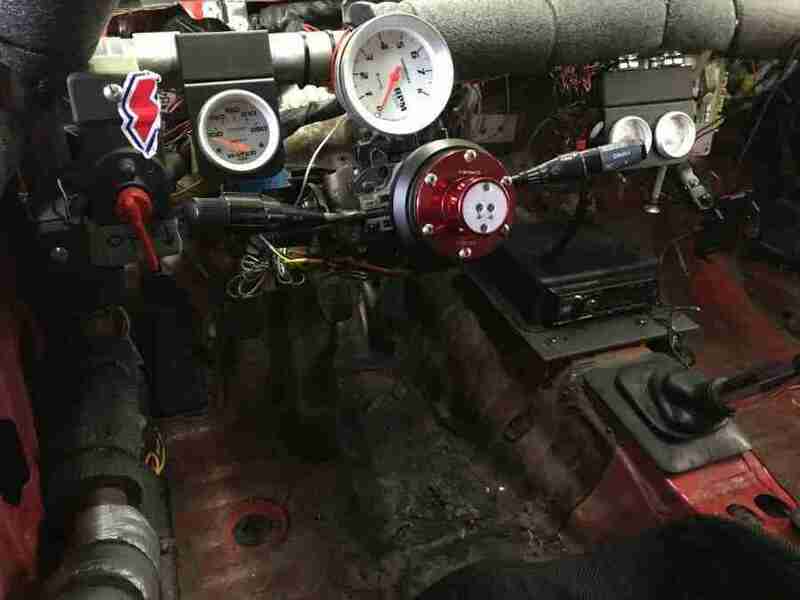 NachoFriend Racing has completed other improvements as well, including the addition of a stereo, central custom fuse box and more mirrors.. We are now ready for the Celica to compete for 3rd place in Shelton, WA. Expect full coverage of that race here.